Von B. and D.L. Wilson give her honor on "She's Unbelievable"
(January 17, 2019) South Bend is not the city that immediately comes to mind when talk turns to Indiana towns that were or are hotbeds of R&B music. Gary and Indianapolis definitely. Fort Wayne perhaps. But South Bend? Here’s where a little history lesson might come in handy. Motown hitmakers Junior Walker & the All-Stars hailed from South Bend, and in recent years a vibrant R&B and hip-hop scene has developed in the northcentral Indiana town. Singers and songwriters Von B. and D.L. Wilson keep that momentum going with their song “She’s Unbelievable,” a track that wears the label adult oriented R&B proudly. “She’s Unbelievable” is a sunny and bouncy mid-tempo tune with an infectious bass line that finds the pair paying tribute to an amazing lady who captured their attention on the dance floor. The track sports a hook that will bore itself into your subconscious and become an ear worm for all the right reasons. 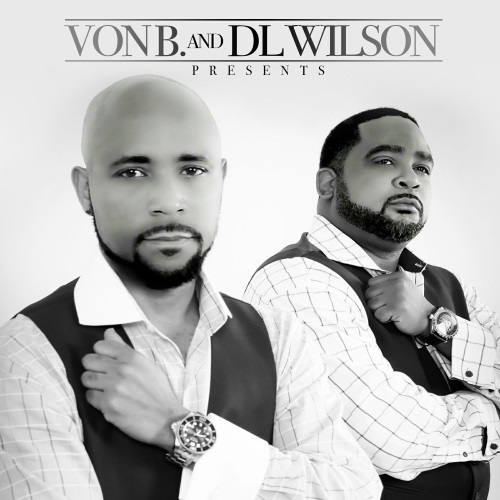 Although the pair’s home is flyover nation for much of the R&B world, Von B. and D.L. Wilson’s story is pretty universal right down to having music sewn into their DNA. Von B. was born in Los Angeles but was raised in South Bend. He and South Bend native Wilson were members of a local singing group while students at South Bend LaSalle High School. They’ve done background work for some major names. However, the desire do their own thing never dissipated. Both artists have uncles who sang in The Encos, a 1960s vocal group that had a large following in these parts. Von B. is related to Marv Johnson, the vocalist on “Come To Me,” Motown’s first single in 1959. The two artists show both their sense of musical history and their attention to the groove on their newest single, “She’s Unbelievable.” And in the process, they do South Bend proud. Check it out below and welcome Von B. and D.L. Wilson to SoulTracks.